Cedar Ridge at Piney Orchard is a 55+ community located in Odenton, Maryland. This age-restricted neighborhood is within the master-planned Piney Orchard community. Residents of Cedar Ridge at Piney Orchard enjoy private amenities and low-maintenance homes. Homebuyers can choose from condo units that are housed within four-story buildings with a secure entry and elevator access. Ideally situated in Anne Arundel County, residents living in Cedar Ridge at Piney Orchard are never far from daily conveniences. The community is just minutes away from major highways, shopping, restaurants, banks, and entertainment. Active adults living in Cedar Ridge at Piney Orchard enjoy private amenities. The clubhouse is the focal point where neighbors come together to socialize and have fun. The gathering area is a great place where homeowners can relax and enjoy the company of family and friends. Residents can stay healthy in the exercise room or play games in the card room. A catering kitchen is on-site to prepare snacks for a community meeting or event. Outdoor amenities are also available to homeowners. They can take a dip in the pool or lounge on the patio during the summer months. They can also play with friends on the tennis or bocce ball court. Cedar Ridge at Piney Orchard offers residents scenic walking and biking trails as well as a gazebo and park space where they can enjoy the beautiful surroundings. Residents of Cedar Ridge at Piney Orchard also enjoy all of the amenities found at the master-planned community of Pine Orchard. Here, they can access the 15,000 square-foot community center and enjoy the indoor pool, fitness center, meeting rooms, and learning center. Outdoor amenities include three pools, four tennis courts, a 45-acre nature preserve, playground for grandkids, R.V. and boat storage, and scenic lakes and ponds. Well-known builder Beazer Homes constructed Cedar Ridge at Piney Orchard between 2003 and 2006 and now has 450 condo units. The community has eleven four-story condo buildings with elevator access and secure entry. Condo units range from approximately 1,400 to 1,963 square feet in size. They have two or three bedrooms, two bathrooms, and an attached one car-garage or reserved parking lot space. Condos feature private balcony views, large bedrooms, stainless steel appliances, tray ceilings, crown molding, granite countertops, and spacious closets. Residents of Cedar Ridge at Piney Orchard enjoy an active and social lifestyle thanks to all of the activities and events held in the community. Homeowners can gather with neighbors in the clubhouse, play a few games of tennis or bocce ball outdoors, or join a card game for fun. They can host community events or introduce new group activities that they can share with others in the neighborhood. Cedar Ridge at Piney Orchard enjoys a prime location in Odenton, Maryland. Homeowners have access to major highways that make driving around the area easy. They can do all of their shopping down the road from the community at the Village Center Shopping Center. There, they will find a Food Lion, banks and ATMs, a gas station, restaurants, and retail shops. Residents are never far from parks such as Midland Park, Odenton Park Recreation Area, Patuxent River Park. Golfers will love being close to several courses like Walden Country Club, Crofton Country Club, and Bowie Golf and Country Club. Medical facilities are about ten minutes away for all of your health needs. Homeowners are also within driving distance to Baltimore, Annapolis, and Washington, D.C. for big-city attractions. Cedar Ridge at Piney Orchard is the perfect active adult community for 55+ homebuyers in Central Maryland. Active adults have private amenities in Cedar Ridge at Piney Orchard. Residents of Cedar Ridge at Piney Orchard also have access to the master-planned amenities at Piney Orchard. Community Center - 15,000 Sq. Ft. There are plenty of activities available in Cedar Ridge at Piney Orchard. Here is a sample of some of the clubs, activities and classes offered here. Cedar Ridge at Piney Orchard consist of eleven four-story condo buildings with elevator access and secure entry. Condo units range from approximately 1,400 to 1,963 square feet of living space. They have two or three bedrooms, two bathrooms, and attached 1 car-garage or reserved parking lot space. 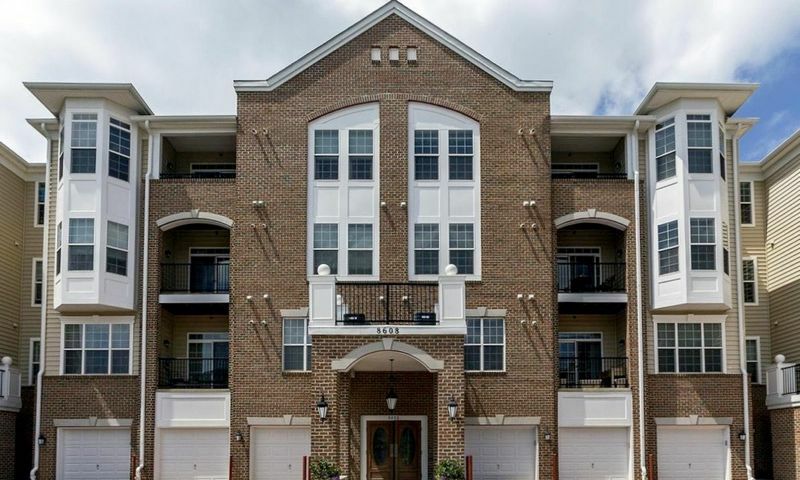 Condos feature private balcony views, large bedrooms, stainless steel appliances, tray ceilings, crown molding, granite countertops, and spacious closets. Please Note: Not all floor plans are available at this time. 55places.com is not affiliated with the developer(s) or homeowners association of Cedar Ridge at Piney Orchard. The information you submit is distributed to a 55places.com Partner Agent, who is a licensed real estate agent. The information regarding Cedar Ridge at Piney Orchard has not been verified or approved by the developer or homeowners association. Please verify all information prior to purchasing. 55places.com is not responsible for any errors regarding the information displayed on this website.